I’ve been a big Promise fan since the original FastTrak (later renamed FastTrak33 to fit with the product line). At the time I had a bunch of 2 GB Western Digital hard drives that I didn’t know what to do with. The idea of using a RAID controller to make one big 8 GB ( wow, that’s big ) drive was fantastic. Of course there were some growing pains, but the card worked great. What’s even better is that I just requested a new BIOS chip for the card and it was sent for free; unfortunately Promise didn’t switch to a flash BIOS until the FastTrak66. But as usual I digress. In the early days of ATA RAID controllers RAID 0, 1 and 0+1 was the limit of availability, thus relegating it to workstations and enthusiast machines. Of course SCSI RAID controllers allowed for so much more, but at an exorbitant prices which flew in the face of the entire ATA RAID concept. 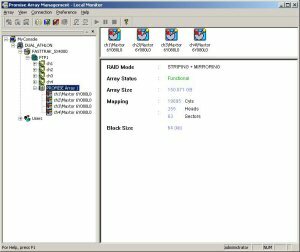 Adaptec was the first to release an ATA RAID 5 controller, the AAA-UDMA, which was a SCSI RAID card with a “translation” chip for IDE drives. It’s performance was adequate, but more importantly paved the way for Promise SuperTrak100, and the rest is history. My focus has shifted to RAID 5 controllers, since they are perfect for entry level servers used in small to medium enterprises ( SME or SMB ). Today’s motherboards bundle RAID 0, 1 controllers onboard for a minimal charge, and Intel and VIA are now building them into their chipsets with the advent of serial ATA. Unlike these controllers, RAID 5 requires some hardware horsepower to calculate the parity bits and spread the data across the array. Onboard RAM is also a necessity, along with the CPU and ATA controllers bringing the complexity and cost of the product up. Imagine my surprise when I heard of the Promise FastTrak SX4000 RAID 5 controller selling for less than half of it’s competitors. The SX4000 is a new step for Promise in a lot of ways. Their two previous RAID 5 cards, the SuperTrak100 and the SuperTrak SX6000, used Intel i960 processors along with three Promise ATA ASICs (Application Specific Integrated Circuit ). They were full length PCI cards with six IDE connections, one RAM slot and battery backup. Let’s look at the SX4000. Cracking open the box we get the card, a quick start guide, a product manual, drivers and software on 3.5” floppy and CD-ROM, four 80 wire 40 ping ATA cables and two thick molex power “y” splitters. On to the card: it’s a mid length ( not small but not full length ) PCI card with four ATA connections. Bottom right is the 168 pin DIMM slot for SDRAM from 64 MB to 256 MB. A small speaker sits above. The only processor or ASIC onboard is the Promise PDC20621, which is described in the literature as an XOR engine. This single chip solution saves cost from the previous SuperTrak series, described above. On the faceplate are four red status lights; it’s interesting to note they’re not mentioned in any of the literature as to what they do. From the card layout you can also see what isn’t there: a spot for a battery backup in the bottom left and one can only guess what that space in the top right is for. Installation was straightforward: plug the card into an available PCI slot, either 32 or 64 bit, 33 or 66 MHz. The SX4000 is a 66 MHz 32 bit PCI controller capable of 266 MB/s maximum. I installed an available 256 MB ECC DIMM in it’s single memory slot: you can use 64, 128 or a 256 MB DIMM. The case I’m using, and Antec SLK3700AMB, has three drive lights, so I connected one of them to the header on the SX4000. Hooked up the four drives and powered the system. The card is longer than most PCI adapters, but it isn’t full length either. I had to move one of my hard drives to accommodate it, but that was the only issue. For some reason all AMD 768 MP motherboards put the 64 bit 66MHz PCI slots in the middle of the board, instead of the bottom where most cases leave room. Once the SX4000 initialized it prompted me to enter the BIOS and define an array. Here you can view, define, delete or repair an array. RAID levels 0, 1, 0+1, 5 and JBOD (just a bunch of disks) are supported. As well all these functions and more can be performed in the operating system via the Promise Array Management, or PAM in Windows and the Array Utility in Linux. That’s right, the SX4000 is supported in various Windows and Linux flavors. For this review Windows 2000 Server is used. The BIOS interface is dead easy, and arrays can be deleted and created with no delay or wait time. Booting into Windows 2000 server I installed the drivers and rebooted. The SX4000 shows as a SCSI device in Device Manager, as do all ATA RAID controllers. The array shows under disk drives as a Promise Array. Installing the Promise Array Management utility was another non event, but a username and password has to be created for array management. Once installed PAM can be managed from any PC over the network by installing PAM wherever and selecting remote management. PAM is straightforward to use and allows for the gamut of options, including enabling write back cache. I didn’t find this aided performance, and the default is having it disabled. Changes to an array require a reboot, but it nice to make changes remotely and schedule a reboot without interacting with the machine. Performance was excellent, in relation to the SX4000’s abilities and cost. Check the benchmarks and testbed for more information. Promise designed the card as a one chip solution, covering the ATA controllers, RAID calculation and the like. Check the [intlink id=”2329″ type=”post”]cache size comparison[/intlink] to see what fits your needs; I anticipated better performance from more cache, but that’s not the case. I’ve had this card for the better part of six months, trying to arrange competitors. It performed flawlessly across three platforms as I ran various benchmarks and changed my platform and software. I that time there were BIOS and driver revisions, which were implemented on this final benchmarking and platform. As I went to format a RAID 5 array for the final PCMark2002 benchmark, I received an error that the format failed. I played around and ran diagnostics on all the drives individually, plus used them with other ATA RAID controllers without incident. I submitted an incident report via the Promise website, or tried to. For two days the form created SQL errors. On the third day it went through, but I didn’t receive a reply. I waited more than a week and didn’t hear back again. I’m sending an email with the same information this week and will post what happens. This is my first bad experience with Promise’s tech support, and I’m hoping it only a bug with their online reporting form. I heartily recommend this card for users looking to utilize four or less drives in a RAID 5 array. It’s half the cost of the Adapter 2400A or 3ware 7500 series, even with the additional purchase of the required DIMM. After my email to tech support I received an answer three days later suggesting the problem lay with the DIMM I was using. Replacing it with an available 128 MB ECC PC133 DIMM seemed to do the trick. 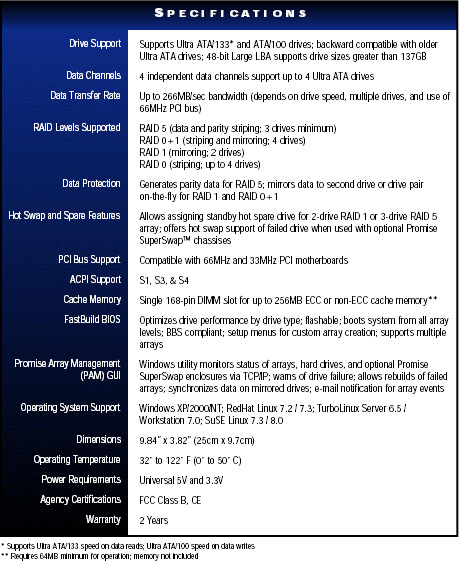 Promise has released new drivers, BIOS and PAM for the SX4000. Included is a utility to test memory installed on the card. As well Windows Server 2003 drivers are included. Editors note: this review was migrated from the old eBabble.net site and the photos updated. Originally published May 22nd 2003.